Lake Houston Sports & Recreation Foundation and Texas Parks & Wildlife Restock 100,000 Hybrid Florida Bass into Lake Houston. Volunteers with Lake Houston Sports & Recreation, a non-profit organization, distributed 100,000 Bass around Lake Houston on Wednesday, June 19, 2013 for the restocking program to help Lake Houston become a cleaner and healthier lake. Lake Houston is 1/4 of the City of Houstons drinking water source. 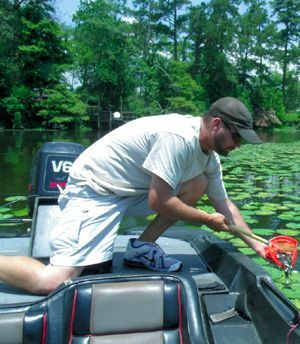 With the plant restoration project underway and restocking of bass it is believed Lake Houston will become a cleaner water source for the people of Houston. Volunteers with 10 to 15 boats distributed the fish around the lake at 103 Page Lane Huffman, Texas 7736. Jason Miller and others restocked in at least three locations during their efforts. HIGHLANDS  Chamber members heard plans for major expansion in two Baytown area chemical plants. The new construction will generate two types of jobs, according to Van Long, plant manager at the Cedar Bayou ChevronPhillips refinery. Construction jobs over the next five years could come to 4000 for their project, and another similar amount for the ExxonMobil plant expansion planned at the same time. In addition, other projects in the chemical and oil business in the Baytown/Mont Belvieu area might generate as much as 15,000 construction jobs. After the plants are built, ChevronPhillips will need about 400 to 600 permanent employees and contract workers. The other plants will generate similar needs for workers, he said. These new plants will make I-hexene and ethane. Chevron, Gulf Oil and Phillips 66 joined as one company in July 2000, Long said. 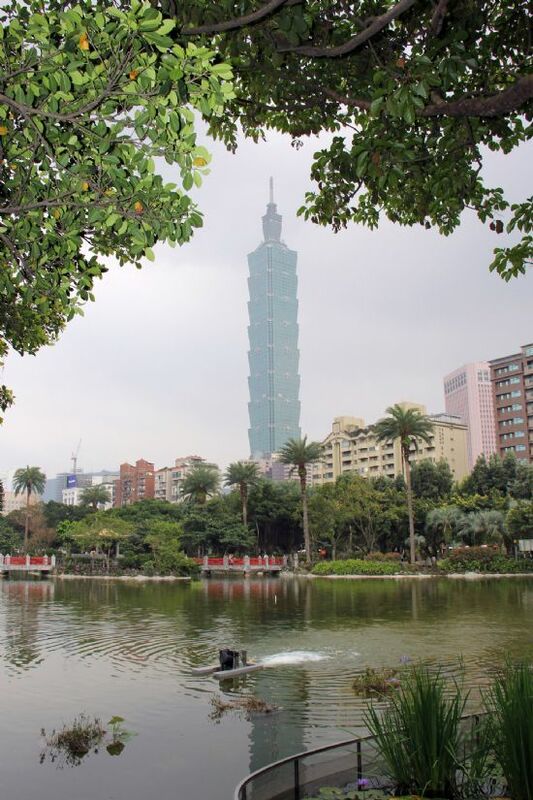 The plant makes various types of plastics, which usually end up as polypropylene in our everyday plastic products. Long said that his company is working closely with Lee College, to train workers for the jobs at these plants. They are providing 50% scholarships for workforce development scholars, and 100% if dual credit. They are also providing mentors to the program. Graduates get an Associate of Applied Sciences degree. Baytown is the center of this expansion due to new shale deposits coming through pipelines and rail cars from Eagle Ford and Barnett to Mont Belvieu. Growth of new ethane supply in the United State, Long said, will mean 17,000 new chemcial jobs in the U.S., and 81,000 new jobs in Texas in all industries outside the chemical industry. There are a total of 19 chemical plants in the greater Baytown area, with 5000 full time employees now, soon to be 6200, and 7500 contract employees. HIGHLANDS  About 60 Rotarians, family and friends gathered last Friday night at the Boat Club in Highlands for the installation of new officers, board, and president for the next year. Dane Listi welcomed everyone, introduced guests, and then reprised the accomplishments of his term. The club has been quite involved this year in PIE, or partners in Education, with bikes, dictionaries, and birthday cake as incentives at the Elementary school for students. In international matters, he noted our help with the District 5890 in the Guerrera Eye Clinic, purchasing a van to bring patients to the clinic for work on their teeth and eyes. The club also helped pay for a new water pump for a village in El Salvador. Disaster relief was important this year, with donations for victims of the explosion in West, Texas as an example. Locally, the club helped support the summer reading program at the Stratford Library, and two Interact clubs at the high schools. The scholarship committee reviewed 64 applications, and award $30,000 to 18 college bound students from the community. And with the partnership of District 5890, we continued the worldwide fight against Polio, which is now almost entirely eliminated due to efforts of many, including Rotary Internatioinal. The club continues a high level of giving to R.I., this year averagin about $225 per member, one of the highest in the nation and world. After facetiously thanking Denise Smith for talking him into a presidents term, Dane admitted it had been a great experience, and welcomed Aaron Cole as the next president. Next, Dane presented awards for perfect attendance, as follows: Weston Cotten 27 years (Note, Weston was not present to accept), Charlie Ward and Patricia Scott 13 years, Robert Woodall 4, Betty Brewer 3, Larry White and Sheila MacDonald 1 year. Paul Harris Awards were given to Robert Woodall and Jeremy Rosenkrantz. 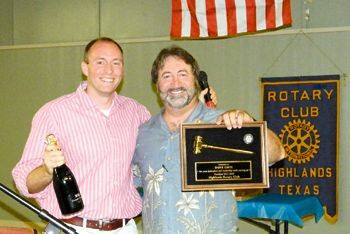 Rotarian of the Year was Dane Listi, voted on by all the members of the club. Bill Palko, next years Assistant Governor from District 5890, presided over the swearing in of the new board and officers. Palko is a member of the North Shore Rotary Club. New officers were as follows: President Aaron Cole, President Elect Raymond Gonzales, Treasurer Sheila McDonald, Secretary Teresa Martin, Sergeant at Arms Jeremy Rosenkrantz, Membership & Partners in Education Chair Betty Brewer, Club Adminnistration Chair Denise Smith, Program Chair and Public Relations Gilbert Hoffman, Rotary Foundation Chair Charlie Ward, Scholarship Chair Dr. Larry White, and Highlands Rotary History & Education Chair Tricia Scott. The new president, Aaron Cole, outlined his ideas for the next year for the benefit of the audience. He said his goal is to maintain the culture of the club, because every club but especially Highlands is unique, and has proven to be a great club. He personally came to the realization, after joining and belonging to the club for a while, that the essence of the club is giving back to the community and others, not personal or business gain. 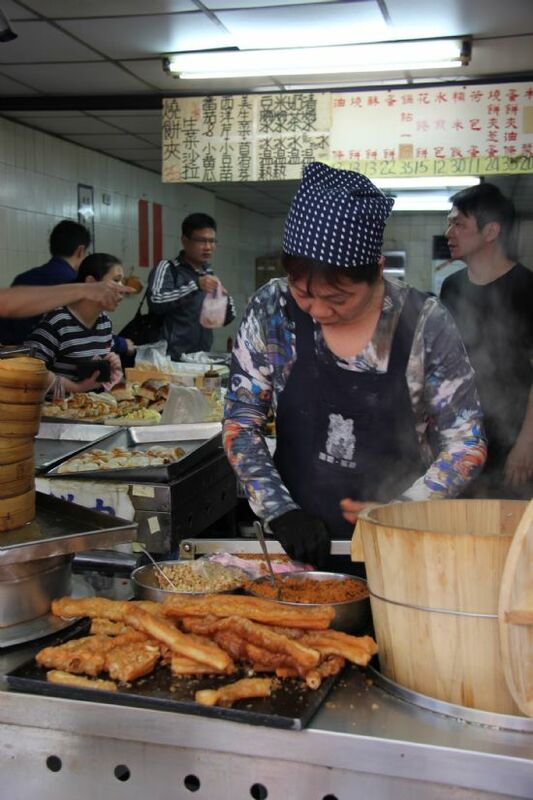 He said his second goal for the year was to increase the membership, and also increase the income from the Chili Feast for additional scholarships. He noted how important the club has been to Highlands over the years, and that the Highlands Rotary has its fingerprint on the community. The club is observing 65 years of service, and R.I. has the theme Engage Rotary, Change Live this year. HIGHLANDS  Local residents who have been concerned about an apparent high rate of criminal activity in the area, are hoping that the latest initiative by law enforcement agencies will have an affect on the perpetrators of such crimes. In February, at a press conference, Sheriff Adrian Garcia and Pct. 3 Constable Ken Jones announced the formation of a joint task force to combat the problem with additional resources, a focus on the area, and improved communications between agencies. 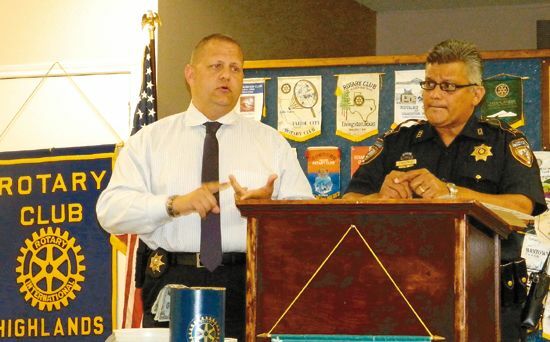 According to a presentation made at a recent Rotary luncheon, by Captain Joel Inocencio of the sheriffs office, and Capt. Jasen Rabalais of the Constables office, the trial of the task force has been very effective, and will now be a permanent presence against crime in the east part of the county. Since February, the TF has made 66 felony arrests, and 45 misdemeanor arrests, according to the officers. As well as working closely together, they also involve other agencies, including DPS, FBI, DEA, and ATF they said. The task force offices together in the same building, shares radio calls, and case information. They pointed out that their deputies have the same training, which is T-CLOSE, required by the state. The task force now consists of 2 sheriffs deputies and one canine unit, one lieutenant, 3 sargeants, and 2 captains. They work 40 hours a week, Monday through Friday, only on their cases. However, they are available 24/7 to work with other deputies on calls. Their objectives are to be a Pro-Active Patrol, meaning they anticipate crime rather than react to situations, have zero tolerance, answer traffic calls, and conduct special assignments as well as all types of ordinary crimes. The officers reminded the audience that although they are working on problems with game rooms, and drugs, they need intel to take action. Game rooms are legal until money is paid out. Citizens are urged to work with the new task force and report suspicious activity on the HCSO website: iwatch harris county.com. You can post information on the Facebook page of Captain Rabalais: Facebook.com/CaptainJasenRabalais. You may also call the sheriffs office on Wallisville Road, and ask for the Task Force. The number is 713-455-8050. The constables dispatch number, answered 24/7 is 713-453-6959. CROSBY  This very week is the time for the largest party in northeast Harris County, that party is the Crosby Fair & Rodeo Cook-off. 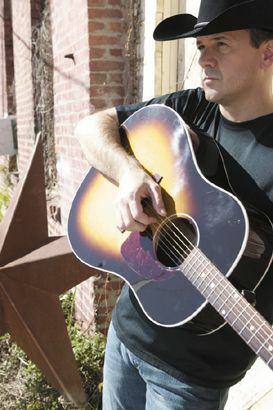 The weekends party features Charlie Montague opening for Roger Creager on Friday, June 14. Local favorites Devin Sharp and Alice Doskocil open on Saturday, June 15 for Stoney La Rue on stage within the Crosby Fair & Rodeo Fairgrounds. A parade on Saturday morning lines up at 9:00 a.m., starts at 10:00 a.m. and will go out from the fairgrounds west on Church St. turning right to First Street, then right on Kernohan (east) to Crosby-Dayton Road left (north,) then right again onto Pecan Street (southbound) leading back to the Fairgrounds on Church St. This years theme is Its All About the Youth. In keeping with that theme, Dr. Keith Moore, CISD Superintendent and family will play Grand Marshal.There are six awards to be won in the parade based on the theme Its All About The Youth, a Best in Show first through third place is awarded and first to third in Best Wagon or Trail Ride is awarded. The Cook-Off starts Friday, June 14th, gates open at 6:00 p.m. and Saturday, June 15th admission begins at 3:00 p.m. lasting until all is done. A total of 60 teams is signed up. The Crosby Fair & Rodeo Livestock Auction begins Wednesday with a special fete for auction buyers at 4:00 p.m. After the aAuction Buyers Dinner, the auction begins at 6:00 p.m. This even raises the most funds that go directly to the livestock participants from the auction process. The best place to meet most of the community is at the Livestock Auction. The 67th Annual Crosby Fair & Rodeos Rodeo 2013 begins Thursday, June 20th featuring Colt Ford and opened by the Crooked River Band. June 21 Texas native sky-rocketing to the top of the charts, Sarabeth opens for Season 2 X-factor winner Tate Stevens. Saturday, June 22 is Tough Enough to Wear Pink Night featuring Kevin Fowler and opened by local sensation Breelan Angel. Tough Enough To Wear Pink asks all participants and fans to wear pink that night so that sponsors will donate matching funds for each person wearing pink to the Crosby Fair & Rodeos American Cancer Society drive that last year send $5,000 to the San Jacinto Methodist Pink Heals Endowment. Rodeo events start at 7:30 PM. Musical entertainment for each night of the Cook-Off and Rodeo starts at about 9:00 PM. after two full hours of exciting P.R.C.A Rodeo. CROSBY  Precinct 2 Commissioner Jack Morman is making good on his promises to be the infrastructure commissioner for Northeast Harris County and on Tuesday he broke ground at Crosby Volunteer Fire Station #2 to begin the widening of South Diamondhead Boulevard. First to speak at the groundbreaking was Alan Kulak, Fire Chief of the Crosby Volunteer Fire Dept. who welcomed the dignitaries and community to the fire station. Early efforts will smooth the access to and from the fire station, then the widening will begin from there west. In total the project cost to Harris County Precinct 2 is to be $1.9 million, according to engineer Jack Rodriquez, the engineering process went smoothly and the construction process alone was over $1.4 M of that $1.9M. 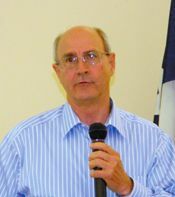 Rodriquez pointed out that various overlay projects in the rest of Crosby have now been accomplished and that when given the choices of tackling the asphalt roads within the subdivision and widening South Diamondhead, the property owners association overwhelmingly chose widening the south entrance and exit to the subdivision. The design team after specifications were set by Precinct 2 was LandTech Consultants, Inc. with GEOTECH and Crouch Environmental Services, Inc. The construction team is Angel Brothers. CROSBY  The efforts of a local community activist have helped the odds of survival of some local students. Scott Stephens put together a foundation that is dedicated to promoting heart screenings across Texas after his son, Cody, died of sudden cardiac arrest in May 2012. The Cody Stephens Go Big or Go Home Foundation has found its way this week into Crosby High School. 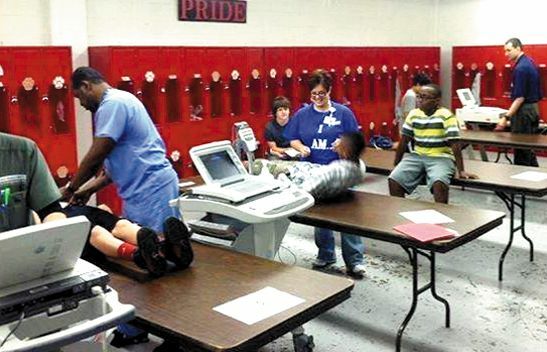 Eight hundred and one Crosby students were screened on June 3 by East Houston Regional Hospital. The screenings found there is a potential for problems in about seven of the students. Codys hometown got the message, a great turnout! Thanks to my friends at East Houston Regional Hospital for providing this service in a very cost effective and professional manner. said Stephens. Sudden Cardiac arrest is the leading non-accidental death of student populations. About 2000 deaths per year in the U.S.A. occur for those under 25 years of age. By funding this simple, non-invasive ECG screenings many deaths of youths can be prevented. Stephens asks you to support Codys Bill HB 1319 by informing your local State representative of your support. In Highlands and Crosby that is Wayne Smith and in Huffman Dan Huberty. For informatin and to make donations visit: www.codystephensfoundation.org.